With great pleasure I remember the days when ambrosial smell waft off the kitchen and filled our home. The ones of you who are familiar with the Polish kitchen, know what I mean. My mother was busy at the stove – sometimes for hours, sometimes just for a short moment – and the result was always a revelation for the taste buds. One of the most favourite Polish dishes are without question pierogies. These small steamped buns are known in other countries under different names and in regional varieties. In Siberia they are called pelmeni, in China Jiaozi, in Japan Gyoza and so on. My mum used to fill the pierogies with sourcrout and mushrooms. They were served with fried onions and smetana – a kind of sour cream. 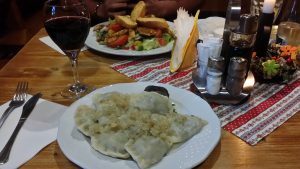 During my last holiday in Poland I surely didn’t miss to order a plate of fresh handmade pierogies! Another classic dish of my childhood are kluski. These are dumplings made of mashed potatoes, eggs and starch, formed into little flat round patties. The „signature feature“ is a small pit in the middle of each patty. Kluski go well with savoury side dishes, but are also fantastic in a sweet variation. Kluski were also inherent part of our Christmas dinner. Here you can see the result of my efforts :). 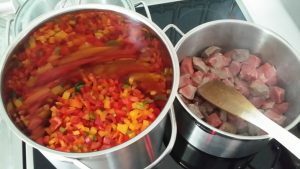 A well known fine polish national dish is ‚bigos‘ – a cabbage stew with several sorts of meat, bacon, bay leaves and mushrooms. Every polish mum got her own recipe. I like it with an extra portion of spice and pepper. One of my favourite meals on holidays is ‚jadlo drwala‘. It is a speciality of a polish region called Beskides. Every time I’m on vacation in this region, I order this dish. It is a kind of potato pancake filled with goulash.